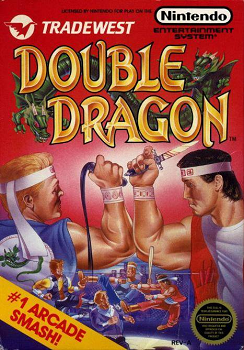 Double Dragon is a beat-em up action game that was ported from the arcade to the NES console. It featured weapon pick-ups and even a level-up system. We check out how this game plays today. Released in 1988, this port would share the same name as the arcade version. It would ultimately kick off a NES series that even contained a crossover series combining elements from this and another series, Battletoads. The storyline is rather straightforward. Someone has kidnapped Billy Lee’s girlfriend. Billy would then travel the lands trying to find them, following the trail of bad guys along the way. The game play allowed for various moves, but you had a limited number of moves from the beginning. A allows you to punch. B allows you to kick. Pressing both will allow you to jump. For every successful strike, you gain experience points. When you level up, you’ll get a heart on the status screen. If you level up, you’ll gain access to more moves such as a jump kick, knee kick, and arm throw. Along the way, bad guys will introduce various weapons you can use against them if you knock them to the ground. This includes a switchblade knife, baseball bat, oil drum, and baseball bat. Players are only allotted three lives. If a player runs out of life, they have to start over the level in question. If the player uses up all three lives, the game is over and you’ll be put into the menu screen again. There are different enemies to be found. There are guys in blue pants. There are purple haired bad guys. There are very large bad guys that sort of count as mini-bosses. There are even orange haired bad guys to be found as well. The layout of the levels are fairly straight forward in the beginning, but gradually increase in complexity. They start off with your standard street, but later on, there is the introduction of climbable chain link fences, pits, ladders, bodies of water, docks, and even moving platforms. One strategy I found useful was to knock out an opponent, then stand over top of them and attack as they are getting up so they don’t have a chance to damage you. If you complete a level, you’ll be granted with a life re-fill, so it’s no big deal if you get some damage within a level. As long as you don’t lose lives in the process of completing a level, you are more or less fine. I found this to be one of those extremely hard NES games. It’s hard to beat the first two missions without losing all of your lives in the process. 95% of this game is all about placement and timing of your character. You can use weapons to your advantage, but if you defeat the opponents on screen, you magically lose your weapon. I thought this was ridiculous because I thought you should be able to retain your weapon just to help you survive the level. Graphically, for a game that was released in the late 80s, this was actually decent. It was more or less clear what different objects were. The objects had complex textures. Yes, there were games that had better graphics, but there were plenty of games with worse textures as well. So, I’d say the graphics were good all around. Audio was OK. The music was decent on the intro and the first level, but the quality drops off from there. There wasn’t anything truly memorable about this game in terms of music, unfortunately. The sound effects were nicely done. I can’t really think of any complaints in the sound effects department. Overall, this game ended up being one of those short games that you play through a few times and move on. The difficulty of this game ended up making this game unapproachable in the end, leaving me feeling that it’s more work than fun to try and advance to later stages. I would say that if you are heavy into these kinds of games already, then this game might not be so bad, but for average gamers, I’d say this might not be worth it to play other than to say you’ve played Double Dragon. Furthest point in the game: Made it just past the moving platforms in the pink cave before dying to yet more enemies.